Teens helping teens. 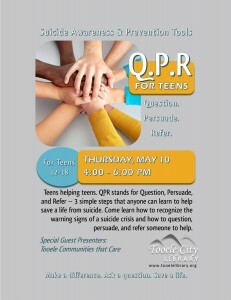 QPR stands for Question, Persuade, and Refer — 3 simple steps that anyone can learn to help save a life from suicide. Come learn how to recognize the warning signs of a suicide crisis and how to question, persuade, and refer someone to help.